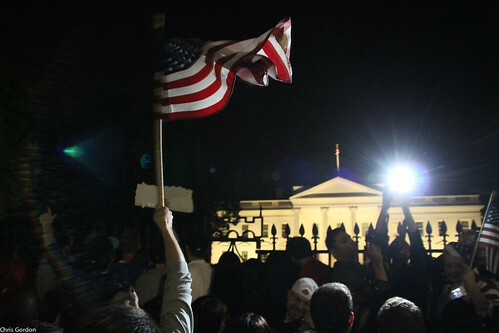 Locals celebrate in front of the White House, Sunday night. Afshan Khoja, a Muslim of Pakistani descent who lives in the DC area, was in tears after President Obama announced the death of Osama bin Laden. Mou Khan, a Bangladeshi-American, also found herself reflecting on September 11th, after learning of bin Laden’s death. “I remember exactly where I was when I first heard that a plane had struck one of the towers of the World Trade Center. My memories are deeply personal, like when a schoolmate I didn’t know called me a terrorist…now, confronted with the news that Osama bin Laden, the man behind the tragedy, has been killed, I find myself conflicted. “I cannot find it within myself to celebrate violence and extrajudicial killing, no matter how strong an urge for vengeance the trauma of September 11th left me,” said Khan, in reference to the celebration that took place in front of the White House as news broke of bin Laden’s death. Khoja wondered about the aftermath of such public displays of patriotism. “When I heard the chants of “U-S-A, U-S-A” I felt fear. I don’t understand why, but I wanted to lock my doors. This morning I heard about vandalism and graffiti at a mosque. Between yesterday and today, three people have already asked me why the Pakistani government didn’t know that Osama was in Pakistan for years – I don’t know! Ibrahim Hooper, the National Communications Director for the Council on American-Islamic Relations (CAIR) wasn’t surprised at the public celebrations. Shahid Buttar, a local performance artist and civil rights lawyer worried that other issues were being obscured by the focus on bin-Laden’s death. As we do, we must also reaffirm that the United States is not –- and never will be -– at war with Islam. I’ve made clear, just as President Bush did shortly after 9/11, that our war is not against Islam. Bin Laden was not a Muslim leader; he was a mass murderer of Muslims. Indeed, al-Qaeda has slaughtered scores of Muslims in many countries, including our own. So his demise should be welcomed by all who believe in peace and human dignity. But Khoja said it will take more than Presidential words to address how Muslims are treated in post 9/11-America.